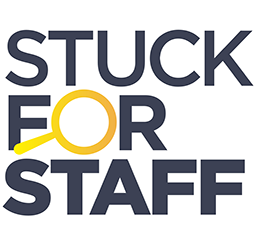 We were looking to recruit new staff, so StuckForStaff.com came along at the right time. The calibre of staff was high and we have added some great new staff to our database. Please review the StuckForStaff.co.uk Email and SMS notifications before continuing. By leaving these boxes checked you agree to receive important information relating to the services of StuckForStaff.co.uk and the Stuck Network. These notices will in most cases form an integral part of the service. Examples include Tender Alerts (highlighting new business leads) and information on the latest StuckForStaff.co.uk features. Please note: Should you wish to stop any of these email alerts simply follow the unsubscribe link found at the bottom of any of our emails. By clicking the unsubscribe link you will presented with the same options as found here allowing you to edit your marketing preferences. Also, should you Opt In to receive notifications by SMS/Text and later wish to stop any of these SMS/Text alerts, you can simply reply "STOP" to any such message. StuckForStaff.co.uk and the Stuck Network will not charge you any fees for its marketing communications, however standard SMS/Text messaging charges and rates assessed by your telecommunications company may apply. When you complete our registration form () you offer to purchase our Agency Services which if accepted by us will result in a binding contract. If as part of our Agency Services we should provide a mechanism for you to pay Staff booked or hired by you. Where you take advantage of that service you agree that you will be responsible for the payment of any liability to taxation and for payment of national insurance contributions in respect of all fees and other sums payable to the Staff. You agree to indemnify us against any claim or assessment made by HM Revenue & Customs or other relevant authority against us for any tax or national insurance arising out of the supply or performance by Staff of their obligations to you and any costs, expenses, penalties, fines or interest incurred or payable by us in connection with any such assessment or claim. You may terminate your registration by giving notice to us at contactus@stuckforstaff.com. Refund of any subscription (or part of it) will be at our sole discretion. You agree to comply with all data protection laws and privacy laws as may be in force from time to time in relation to individuals introduced to you by us or through our site.